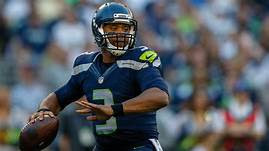 The game itself featured a contrasting matchup between Wilson, playing in just his second NFL season, and Broncos quarterback Peyton Manning, a future Hall of Famer looking for his second Super Bowl title. Things did not go as expected. Denver started out with a bad snap into the end zone that resulted in a safety and 2-0 lead for the Seahawks. From there, Wilson looked like a veteran as he led Seattle on five scoring drives throughout the game. With an interception return and kickoff return both going for touchdowns, the Seahawks scored 36 points before the Broncos could erase the zero from its side of the scoreboard. When the final buzzer sounded, Wilson and his teammates were celebrating a lopsided 43-8 victory. A year later, Wilson was able to put his faith to the test after losing Super Bowl XLIX in heartbreaking fashion. Down 28-24 against the New England Patriots and with seconds remaining in the game, Wilson infamously threw an interception at the goal line when most were expecting running back Marshawn Lynch to get ball. Dear Lord, we thank You that we can make it all about You. Help us to always give You the credit and the praise. In the Name of Jesus, Amen.